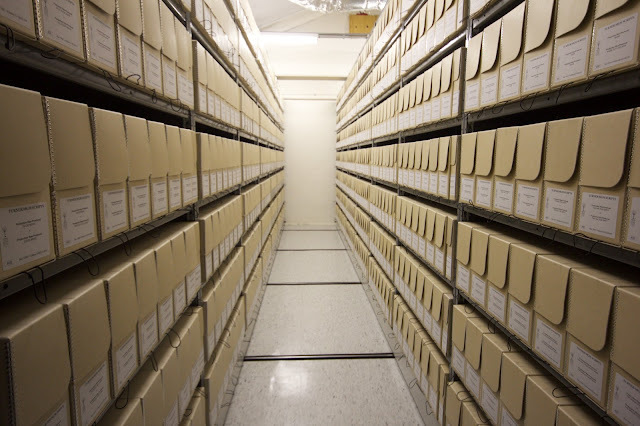 Special Collections includes everything but the photographs and the graphic arts, including sound and oral histories. One floor of the special collection is only accessible by stairs (unless you'd like to squeeze yourself into a ominous dumbwaiter). We wind our way up to the MGM script collection, a behemoth that was received as 1500 boxes of material. I met the herculean staff member responsible for moulding this mountain- a diminutive champion of the archive who spent the years 1994-2002 sifting through the works, cataloguing, eliminating duplicates, formatting the items onto the shelves in the ordered universe they appear today. This ordered universe is housed in the topmost floor in the old water vaults. This is a raw space. Linda reminds me that we are looking at floor to ceiling compactus in place in the top floor of a 1927 building- architecturally unheard of. Turns out an old water treatment plant (and its accompanying storage units) make particularly excellent library conversions- a reinforced water vault is designed to hold weights far beyond anything they could pack onto shelves: even film stock.